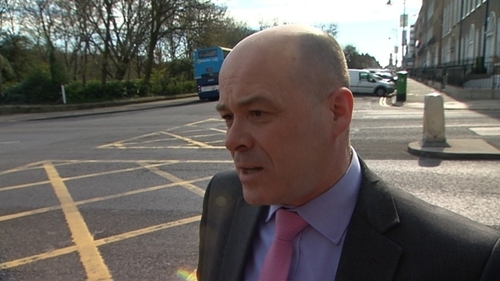 Minister for Communications Denis Naughten has said he sincerely regrets expressing his own opinion to a PR executive acting for Independent News & Media in relation to the company's proposed takeover of Celtic Media. Speaking on his way into the Dáil, Mr Naughten said he had done nothing wrong and anyone who knows him knows he is accessible. He said he regretted expressing a view on the matter but had informed PR executive Eoghan Ó Neachtain he would abide by his officials' advice. Mr Naughten said he had spoken about information already in the public domain at the time, and that he was not responsible for the way Mr Ó Neachtain interpreted that conversation or how he said it to his client. He said he could not take questions on the issue, which he said was before the courts and there was an affidavit involved. Mr Naugthen has insisted he "did not say anything" wrong in his conversation with the PR lobbyist. Speaking in the Seanad this morning, he said he had stated clearly to Mr Ó Neachtain in the very brief conversation that he would make a decision solely on the advice of his officials and he would not deviate from this. "I am not responsible for the way the Mr Ó Neachtain interpreted that conversation or how he fed it back to his clients,"
He went on to say that he "sincerely regrets expressing a view" on the matter. "I didn't say anything wrong. Anyone that knows me knows that I am an accessible minister to my constituents, my colleagues in Leinster House, and the media, my mobile phone is on my website. But he insisted he clearly said he would abide by the advice of his officials and that is what exactly happened. He said the files were there for any member of the Dáil to inspect. Yesterday, the minister said he did not give confidential information to Mr Ó Neachtain in relation to his decision to refer INM's proposed bid to the broadcasting regulator. Last night, Taoiseach Leo Varadkar said the minister had given a clear explanation. However, Minister Naughten and Mr Varadkar are likely to face more questions and pressure from the Opposition on the controversy about the proposed takeover of Celtic Media by INM. Fianna Fáil TD Dara Calleary has told the Dáil that the actions of Mr Naughten smacked of "old style politics and cronyism". However, Tanáiste Simon Coveney defended Minister Naughten saying that he had given a comprehensive explanation of what happened. He said the minister gave no information that was not already in the public domain. Labour Leader Brendan Howlin has said that by passing on his likely course of action to the lobbyist, Minister Naughten had compromised the statutory process. He also warned that the failure of a previous minister to abide by the department's own protocols on contacts with interested parties during the course of a process like this was at the heart of the biggest litigation the State has ever endured. Mr Howlin told the Dail that the "notion that ministers in the middle of a statutory process would take calls from lobbyists, identified as representatives of interested parties, and give them their intended notion and compound that three weeks later by withholding exactly the same information from the Dáil, never putting it on the file for inspection, is very worrying." Mr Coveney responded by saying the Government was not trying to trivialise anything, adding "this was an important process". Sinn Féin leader Mary Lou McDonald said she does not have confidence in the minister and wants the Taoiseach to "be decisive and take action". She said it was clear Mr Naughten had taken a phone call from, and given information to, a lobbyist acting on behalf of INM. She said there are questions about the ethicalness around the whole process and insider information. Sinn Féin has said it would not be tabling a motion of no confidence in the minister at the moment. The party previously ruled out such a motion in relation to Minister for Housing Eoghan Murphy citing the upcoming referendum on the Eighth Amendment. However, the party met last night and afterwards stated it is not ruling out a no confidence motion, which would clearly put pressure not only on the minister but also on Fianna Fáil. Meanwhile, Catherine Murphy has said the idea that Mr Naughten was trying to "split" his personal view from his political opinion in his explanation of the phone call was "absolutely ridiculous". The Social Democrats TD said that "for the decision maker to pre-judge the outcome to the most interested party is absolutely unacceptable". Meanwhile, an expert on corporate governance has told RTÉ's News at One that it would be "naive" to think politicians are not lobbied every day and the controversy around Minister Naughten has been "over-egged". Professor of Management and founder of the Corporate Governance centre at UCD Niamh Brennan said that while "with the benefit of hindsight" it does not read well, it has been overegged as a story in the sense that Minister Naughten indicated that he probably would refer the case to the BAI. She said: "It would have been worse if he'd said he would fix the problem." Ms Brennan said that potentially what is much more serious is the fact that communication of that information went from the chairman of the board of INM to its largest shareholder and not to others. "There are absolute principles around confidentiality in boards and where you are dealing with a publicly-listed company it is a critical principle to the operation of the capital markets that all shareholders - large and small - be in possession of the same information", she said. Ms Brennan said this puts the integrity of capital markets at risk if information is being shared with certain groups but not with others. Ms Brennan said that lobbyists and constituents are constantly calling their politicians as that is the way the system works in Ireland. She suggested that if we want it not to happen like that we should bring in laws that any lobbying in political circumstances should not take place. However, she said that there is nothing surprising about the call Minister Naughten got from someone he knows, although he did speak "loosely". The Irish Stock Exchange said it had noted media reports in relation to Independent News and Media. In a statement, the ISE said that the Central Bank is responsible for market abuse investigations under the Market Abuse Regulations, including the possible misuse of inside information. "As a market operator, The Irish Stock Exchange plc, trading as Euronext Dublin, monitors disclosures, news and market activity to identify disorderly trading and market abuse and we are required to report potential market abuse to the Central Bank of Ireland," the ISE said. "Due to confidentiality obligations we cannot comment on specific companies that are listed on our markets," it added. Meanwhile, the Central Bank said it does not comment on whether or not it is conducting an investigation into a particular matter. In a statement, the bank said that if a suspicion is brought to its attention that "inside information" has been unlawfully disclosed, or is used in acquiring or disposing of a financial instrument or related instruments, it will examine the circumstances and take appropriate action as required. The bank said inside information is defined under the Market Abuse Regulation as information that has not been made public, that would if made public, be likely to have a significant effect on the price of a listed financial instrument or related instruments.